Written on 1st Feb 2019. ShortsTV, the world’s only short film channel, working with Magnolia Pictures, will open “THE 2019 OSCAR® NOMINATED SHORT FILMS” on more than 500 screens across the United States, Canada, Europe, Latin America, South Africa, India and Australia from Feb. 8, 2019. THE 2019 OSCAR® NOMINATED SHORT FILMS will showcase the Live Action, Animation and Documentary short-film nominees’ compilation as three separate theatrical events. On February 6, ShortsTV will debut THE 2019 OSCAR® NOMINATED SHORT FILMS at the IFC Center in New York City, and then roll out across the US and around the world from February 8. This marks the 14th consecutive year of the Oscar® Nominated Short Films theatrical experience. It is the only opportunity for audiences to watch the short film nominees in theaters before the Academy Awards® ceremony on Sunday February 24, 2019. The Oscars will be held at the Dolby Theatre® at Hollywood & Highland Center® in Hollywood and televised live on the ABC Television Network. A stunning showcase of talent and diversity of subjects, the annual theatrical event continues to gain popularity. In 2018, the Oscar® Nominated Short Films earned over $3.5 million in worldwide box office gross, double the level from just two years prior. The nominees’ countries of origin range from the United Kingdom, Ireland, Canada, China, Spain to the U.S. This year the U.S. leads with the most shorts nominations (Four Documentary Short Film nominees’, One Live Action Short Film nominee, and Three Animated Short Film nominees). Furthermore, several films focus on Asia or are from filmmakers of Asian descent, and there are five women directors nominated in this year’s short film category. 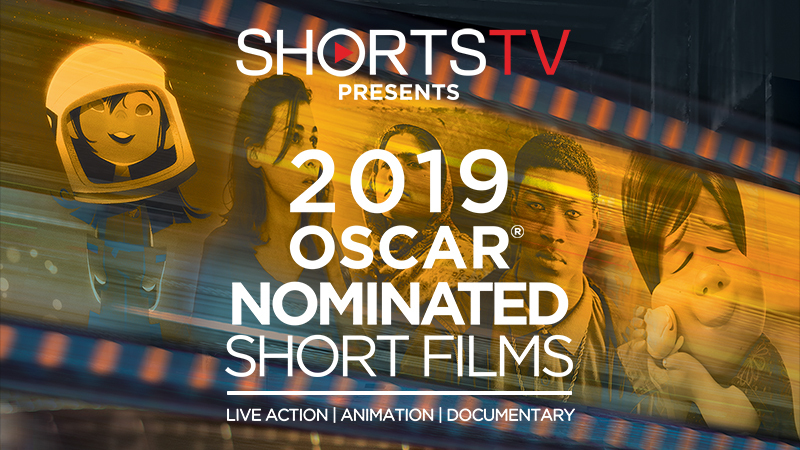 Additionally, ShortsTV will release select OSCAR® nominated short films via the major digital platforms and cable providers on February 19, 2019. The films will also be available on cable via the industry’s Movies on Demand platforms as well as satellite VOD platforms, including iTunes, Amazon, Verizon, Vimeo On Demand and Google Play, DISH, Cablevision, AT&T, Google Fiber, Spectrum and others. Synopsis: Dealing with what comes naturally isn’t easy, especially for animals. In ‘Animal Behaviour’, five animals meet regularly to discuss their inner angst in a group therapy session led by Dr. Clement, a canine psychotherapist. Synopsis: After the high-profile killing of Damilola Taylor, Cornelius’ family move out of London. But when they discover their new town is run by racists, Cornelius takes a drastic step to survive. Synopsis: In 1939, 20,000 Americans rallied in New York’s Madison Square Garden to celebrate the rise of Nazism – an event largely forgotten from history. ‘A Night at the Garden’ transports audiences to this chilling gathering and shines a light on the power of demagoguery and anti-Semitism in America. Synopsis: In a rural village outside Delhi, India, women lead a quiet revolution. They fight against the deeply rooted stigma of menstruation. ‘Period. End of Sentence’ tells their story.